Happy Labor Day! 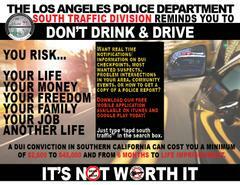 Have fun, but have a plan, Please click on the link for further information from LAPD South Traffic. It is the end of summer and Labor Day holiday weekend is here! It’s a time of celebration that has also become one of the deadliest holidays, with alcohol and drug impaired drivers endangering themselves and others on the roadway. Due to such dangers, South Traffic officers will be conducting DUI Checkpoints this holiday weekend, aimed to drastically reduce impaired driving in our community’s roadways. Statistics nationwide show a dangerous trend in impaired driving. According to the National Highway Traffic Safety Administration (NHTSA), 10,265 people were killed in drunk-driving crashes in 2015, a three percent rise in deaths over 2014. That’s roughly one person killed every 51 minutes in 2015. This is why the Los Angeles Police Department South Traffic Division is working to remind drivers that impaired driving is not only illegal, it is a matter of life and death. If you take prescription drugs, particularly those with a driving or operating machinery warning on the label, you might be impaired enough to get a DUI. Marijuana use can also be impairing, especially in combination with alcohol or other drugs, and can result in a DUI. Officers will be looking for signs of alcohol and/or drug impairment. Specially trained officers will be available to evaluate those suspected of drug-impaired driving, which now accounts for a growing number of impaired driving crashes. Please have a plan this weekend when going out with friends and family, have a designated driver or plan on paying for Uber or Lyft if drinking, it’s never okay to drive impaired. Even if you’ve had one alcoholic beverage, designate a sober driver or plan to use public transportation to get home safely. If you have family or a friend who is about to drive buzzed or impaired, take the keys away and make arrangements to get your friend home safely. The cost of a ride home is cheap. Drivers caught driving impaired can expect the impact of a DUI arrest to include jail time, fines, fees, DUI classes, license suspensions and other expenses that can exceed $10,000. Most importantly remember to report Drunk Drivers by calling 9-1-1. PLEASE NOTE: If you want to get real time notifications from LAPD South Traffic on DUI checkpoints, Most Wanted Criminals, Community Events, Traffic issues, Problem intersections, Police reports, and even submitting a tip, download the LAPD South Traffic free mobile application today. This free Application is available on both Apple Store and Google Play. The Application can be accessed by typing "LAPD South Traffic" in the search field.